We've all seen the Sesame Street episodes about turning off the lights when you leave the room to save energy, but who knew that we would still be applying that same principle to reduce our monthly bills? Shut off lights when we leave the room (duh). Put the TV, bluRay player and Internet thingy on a power strip. Turn the strip off when we leave the house or go to bed. Those silly little lights that glow eat up energy. We do the same with small kitchen appliances. Line dry our clothes in the warmer months (even though our dryer uses gas). Put the ceiling fan on in our bedroom and adjust the air conditioning in warmer months at night. Ceiling fans take up significantly less energy than an air conditioner. Keep curtains drawn in the warmer months to keep the heat out. (Look into energy-saving curtains.) We do the opposite in winter when it's sunny. In September of 2012, we got our energy usage even lower than our "efficient" neighbors! Please keep in mind that we have three exterior lights on our house that stay on 24/7. We leave them all on throughout the night as a safety precaution since our neighborhood is older and has limited street lights. We plan on learning more ways to reduce our energy usage in our home throughout this year. Looks like we need to our heads back in the game. May was cutting it close! 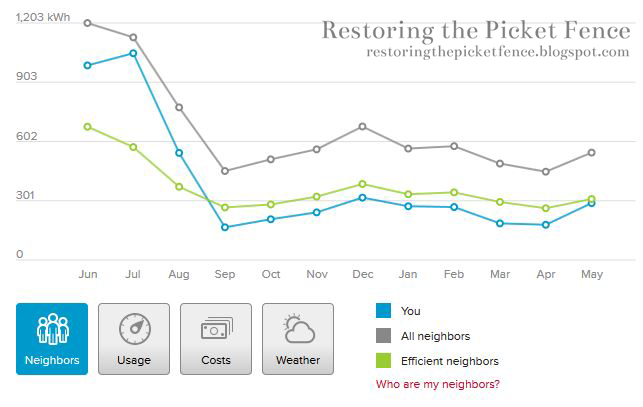 Check your local energy provider's website to see your usage compared with your neighbors. Our energy company determines "neighbors" as people living in the same square footage withing 0.4 miles of us. Do you have any good energy-saving tips?